Demon Records has announced the release of a new must-have Gillan vinyl boxset on 2nd September. ‘The Vinyl Collection 1979-1982’ will feature 5 chart albums - 7 LPs in total - including Mr Universe (1979), Glory Road (1980, 2 LPs, with bonus disc ‘For Gillan Fans Only’), Future Shock (1981), Double Trouble (2 LPs, 1981) and Magic (1982). Ian Gillan was delighted with the vintage feel of the finished product: “It’s a wonderful thing, vinyl… Best held in two hands and treated with respect, as you place it carefully upon the turntable. You just bought something significant, not easily disposable. And look at the sleeves” - he comments, observing one of the records - “aren’t they cool. Read the lyrics and enjoy the artwork, while you are in the groove. No computers involved in the making of this music…enjoy”. will also contain a bonus 7” single for Spanish Guitar. Other Gillan classics featured in this priceless collection include Sleeping On The Job, No Easy Way, Trouble, Mutually Assured Destruction, New Orleans, No Laughing In Heaven, Nightmare, Restless and Living For The City. 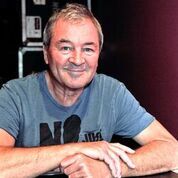 Gillan was born on the ashes of the Ian Gillan Band in 1978, when Ian decided to abandon the jazz-fusion style of his previous project in favour of a more progressive direction, together with keyboardist Colin Towns. The band was dissolved in 1982 following the Magic tour, partly due to Gillan’s health issues with his vocal chords. Still in its brief existence they managed to release 5 top 20 albums and ride the popularity of the NWOBHM sweeping the continent. Ascended to rock royalty status as the lead singer of Deep Purple, Ian Gillan continued making an impact on the rock scene, and has become an erudite elder statesman of the genre. He sang in the role of Jesus in the original Andrew Lloyd’s Webb’s Jesus Christ Superstar and he co-wrote and sang the iconic ‘Smoke on the Water’ among dozens of other hits. He has played to tens of millions of fans, and sold over one hundred million records. To this day he approaches writing, recording and touring with the zeal, passion and commitment of an eighteen year old.